After their spaceship crashes, the survivors only chance of rescue is to find the wreckage of the aft section… on a planet inhabited by ravenous dinosaurs. Directed by James and Jon Kondelik and written by Jacoby Bancroft and Eric Paul Erickson, JURASSIC GALAXY is an entertaining, if imperfect, low-budget science-fiction adventure. The cast, led by Eric Paul Erickson, Madison West, and Jonathan Nation, all give admirable performances as the survivors of the spaceship ‘Galileo’, as does Frankie Ray as the unhinged, longtime castaway, Retch. The special effects are quite serviceable, especially the effects in outer space and effects giving the sky its alien appearance. The CGI dinosaurs (Tyrannosaurus Rex, Raptors, and Pteranodons) are rather well depicted though the integration with the human actors is rather hit-or-miss if closely scrutinized. The pacing of the story flows well, though some of the early walking scenes with no dialogue may have been better served to add more character development or interaction. The film has good cinematographic appeal especially the long shots of the survivors travelling the wasteland. These scenes and the action scenes are accompanied by an excellent musical score that adds grandeur to the adventure. Overall, if you are expecting JURASSIC GALAXY to be on par with JURASSIC PARK and GUARDIANS OF THE GALAXY, you will be disappointed. 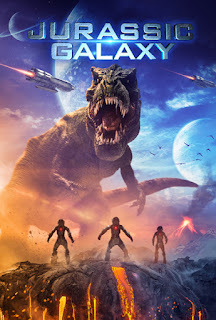 However, if you enjoy a science-fiction film in the best spirit of a Syfy channel Saturday night monster film, JURASSIC GALAXY should more than meet your expectations.